For glamour and elegance at every turn, each Suite at Sofitel Legend Metropole Hanoi promises endless luxuries to its guests. 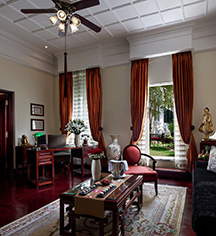 Each accommodation affords travelers an opportunity to enjoy the benefits of Club Metropole, which include butler service, breakfast, afternoon tea, cocktails, and much more, offering guests the quintessential stay in Hanoi. The Prestige Suite boasts 698 sq ft of space, with a well-appointed bathroom and luxurious design aesthetics. This Suite features one king bed and is located within the Opera Wing. With 578 sq ft of spacious interiors and one king bed, the Grand Prestige Suite resembles a modern-day residence, with all of the comforts of home included. This Suite within the Opera Wing typically welcomes high-profile guests who indulge in the space's luxurious interior. 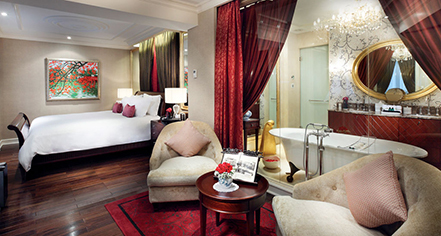 The Legendary Suites feature one king bed, set within the hotel's ambient Historical Wing. Each are named after the hotel's most notable of historical guests, including Somerset Maugham, Charlie Chaplin, and Graham Greene.